I know. 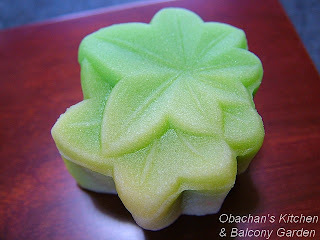 I already posted about green maple in July 2006. But it was kanten jelly last year and this time it’s nerikiri, so please forgive me for repeating the similar theme. 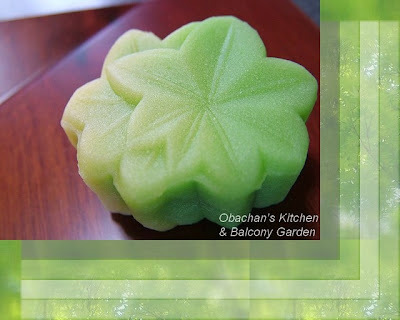 Maple leaf is my favorite wagashi motif and this one looked too nice to ignore -- I have seen the mold of a single maple leaf many times before, but not the one with two leaves combined together like this. So it’s “Golden Week” here. I know almost everyone is traveling now, but I’m a lazy one, if not the laziest. :P And I wanted to post a pic that best describes how relaxing my Golden Week is. Yeah, traveling is great. Going abroad is even more exciting. 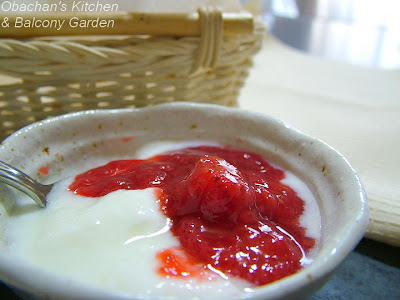 But a lazy morning with homemade strawberry jam, homemade scones and yogurt (no, yogurt is not homemade) -- in the morning sunshine and gentle, soothing breeze coming through the lace curtain -- is not a bad idea, either. 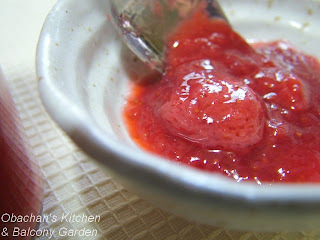 To be honest, I have never made strawberry jam before. 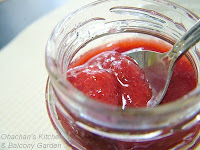 The jam is too popular, thus has never tempted me. 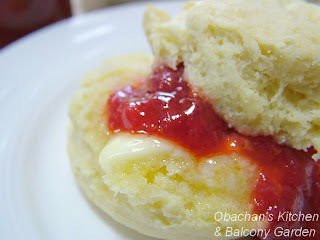 But when I saw some strawberries on sale at a nearby fruit shop yesterday, and remembered the recent comment by Ireney, I knew that I HAD TO make chunky strawberry jam and have it for breakfast in order to fully appreciate my days off in this beautiful time of the year. To my surprise, the jam turned out pretty good, with the perfect amount of tartness from lemon juice and the strawberries. And the berry chunks are just so… Mmmmm… What do I need to say? You already know how good they are, don't you? Oh, I have to try this with vanilla ice cream, too. It'll be the dessert after my lunch of takenoko gohan and miso soup today. One good thing about working in a small office in a rural town is that you often get rewarded with fresh seafood, fruits or vegetables for your hard work. Well, actually the quality of your work does not really matter. It’s just a temporary food surplus. Almost everyone around you has at least a farmer or a fisherman in his/her relatives, and you often find yourself involved in an endless barter trading among kind-hearted grannies and aunties (and sometimes uncles, too). 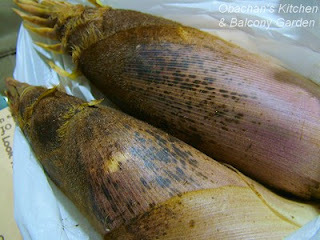 This time what I got was these two fresh bamboo shoots. 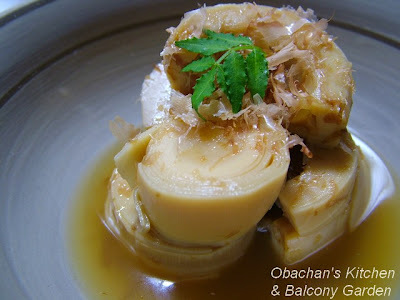 I like bamboo shoots, but I have to admit that it’s a pain in the neck to cook fresh ones properly to get rid of the harshness. How to do it? You need to pre-boil them in hot water with a lot of rice bran added. And you need to hurry; the longer you leave them in the sheaths like this, the stronger the harshness will be. But I really enjoyed the crunchiness of the fresh bamboo shoots. :) Thanks, boss. 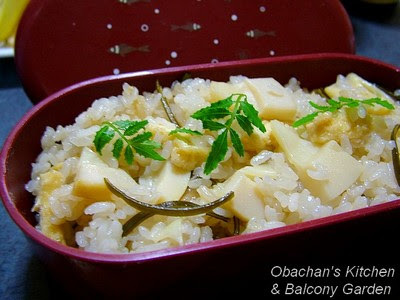 I guess I'm going to chop up the leftover tosa-ni and use them for another batch of takenoko gohan. I still have two small jars of kumquat marmalade sitting on the shelf in my kitchen. Since I don’t like it very much on buttered toast, the choices left are using it for drinks or sweets. Yeah, the financier was a great success. But this time I wanted to try something else. 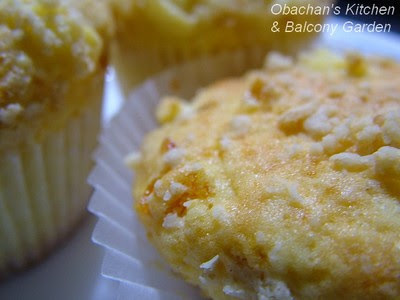 So this was the kumquat marmalade version of an “orange marmalade and crumble muffins” recipe that I found on the net. 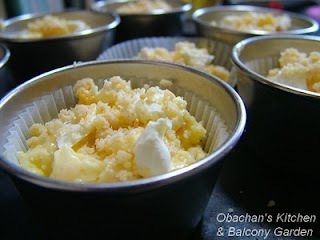 Actually the recipe called for cream cheese and crumbles for the topping. OK. I had some cream cheese left in the fridge. 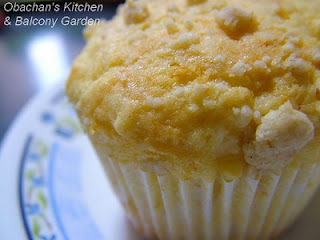 I was so curious about how the toppings would taste with the big kumquat chunks in the muffins. But unfortunately, I didn’t taste cream cheese almost at all. And though the muffins were not bad after all, I have to say that I liked the kumquat marmalade in financier better -- much better. I saw that on TV. I mean, the grapefruit sauce. Grapefruit juice, honey, white wine, veg. oil, salt and rosemary ... 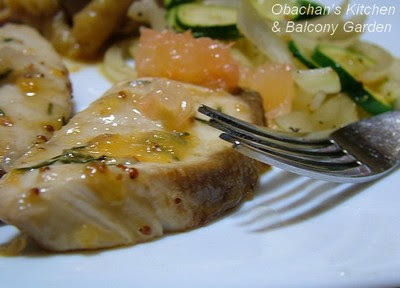 So I just mixed those ingredients (and even added mustard, too) and poured it over grilled fish.